The Next Big Thing is an article by Patrick Cox about how maybe 3D Virtual Reality finally is the Next Big Thing. Which has been long coming. I thought, and many other people thought, that it would happen shortly, back in 1995. The milieu was a seditious, infectious expectation that an unrestrained Internet would liberate information from the control of the philosophically monolithic media. Others daydreamed of landless tax-free sovereignties where citizens chose their allegiances based on personal preferences. Serious thought was going into issues like encryption and private money along the Austrian economists' model. Behind it all, of course, was the long game -- the Metaverse. There seems, ironically, far less discussion of VR today than there was then and the very term has a distinctly cheesy ring to it now. VW for virtual worlds, in fact, seems to have replaced VR among serious researchers, as has been pointed out by one them: Edward Castronova. Similarly, the libertarian dominance of the net world no longer exists, though its imprint persists as a bias in favor of an unregulated Internet among activists such as EFF and net celebrities such as Glenn "Instapundit" Reynolds. As an example of that initial Silicon Valley culture, I remember a party in a private home somewhere in the Valley held about the time Netscape launched. It was attended mostly by people who were working on immersive VW systems, and had been well before Snowcrash or Lawnmower Man. Timothy Leary was there as well as a Japanese television crew, interviewing developers for a market already obsessed with its own cyberpunk anime like the 1987 classic Baburugamu kuraishisu, or Bubblegum Crisis. As far as I know, none of those VW projects survives today, but not because the technology did not exist to allow their success. While processor speed and bandwidth were not ready for a fully-blown real-time metaverse, the more important limiting factor was the market. People, even the early adoptors who downloaded Navigator betas, were simply not ready for such a radical transition. It is largely forgotten, or was never known by most people, that some of Netscape's earliest browsers contained incredibly advanced and visionary groupware and 3D browsing features that have not yet appeared in Microsoft's IE or even Firefox. Well, what it had was several VRML plugins, for one thing. I had a 3D homepage back in 1995, with clickable billboards rotating the earth, and you could fly around in it. OK, I haven't missed it very much, but I have taken notice a couple of times in between that such plugins no longer seem to exist and that nobody has VRML homepages. AlphaWorld was very cool back in .. 97, I think it was. It looks exactly the same 10 years later, and all my buildings are still there. But it didn't really catch on. 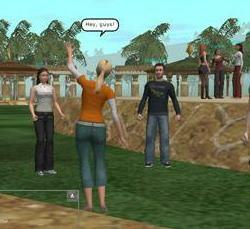 Today there's Second Life, which IS catching on. It works pretty much the same as AlphaWorld, except for some improved features and an economy, and that somehow it has become very cool. And, in the meantime, Massive Multiplayer Online Games happened. That they are positioned as games gets millions of people into them. So, yes, maybe more and more stuff actually will be happening in Virtual Worlds, and sometime soon that will be where all the action is. Just maybe. Patrick Cox points to Multiverse, a startup company that some big names seem to believe in, which also develops virtual world software, but they might just have a model that makes it work on a bigger level. Like, the idea that you can go to any of the worlds with the same client software, and that you can build worlds for free, and do revenue sharing with them when you sell access. Although, what we rather need, I think, is an online multiverse/cyberspace thing that is a matter of protocols, not of who owns the server or the software. Just like the web is the sum of everybody's servers and sites, owned by millions of people, but all talking the same protocols, the virtual multiverse should be the same. I should be able to put up as much virtual reality on my own server as I want, and you should be able to walk into it by opening a door somewhere totally different. I thought you might want to take a look at my project concerning virtual reality.